I love Thanksgiving. It’s one of the few holidays without baggage. It’s a low-commitment gathering that says, let’s just break bread together and enjoy each other’s company. One of the things I would change about the meal though, if I were hosting it, would be the way it’s served. Instead of having every dish available at once and piling food on your plate until it is grotesquely full, I would serve the meal in courses. Small plates brought out one at a time. It would be a meal to linger over and enjoy. It would be simple enough to make the gnocchi days or weeks in advance. They can be frozen, uncooked, until you are ready to drop into boiling water. The desserts and sage brown butter can also be made several days in advance. The morning of, I’d make the two salads, prep the sprouts for baking, and sauté some leeks and mushrooms. Cocktails and toasted almonds would be available for everyone as they arrived. When we were ready for dinner, I’d pop the sprouts in the oven and serve the pre-plated salads. After a 30 minutes, we’d be done with salads and ready for the sprouts. Mmmm… The gnocchi cooks in about 2 minutes, while you heat the pre-cooked leeks and mushrooms and sage butter in the microwave. Serve that with the alongside the kale salad. Finally, dessert comes out of the fridge and freezer for a nice finish to the meal. Mulled wine or espresso would be nice with this dessert, to contrast the cold crumble and ice cream. What do you think? Could you pull this off? What else would you serve? And in case you missed last year’s menu, it’s a bit more traditional. 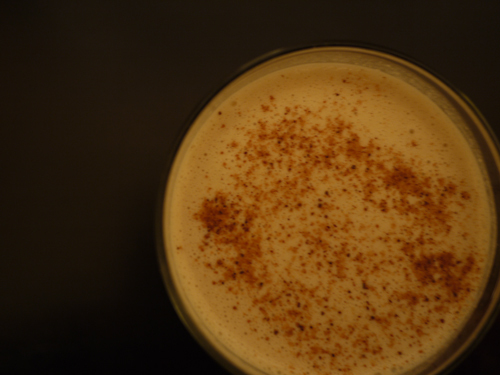 I always think of eggnog as a holiday drink that can only be consumed in the month between Christmas and New Years. I saw the first eggnog latte of the season slide across the counter at Starbucks this morning, though, so I thought I’d better get this posted sooner rather than later. Blend everything except the rum in a high-powered blender until smooth. Combine with rum and pour into two glasses. Sprinkle on a bit more nutmeg for fun.